The flu season is already proving to be deadly, but many people are still refusing to get vaccinated. In Clark County there were 60 deaths and nearly 1,000 hospitalizations last year. 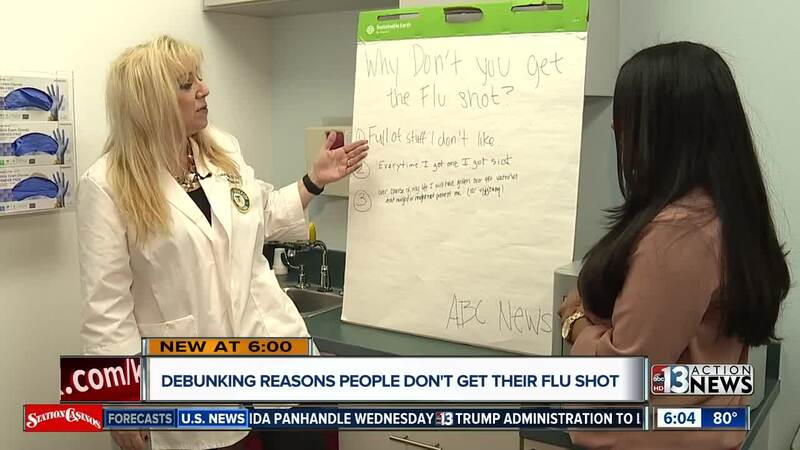 13 Action News asked people their top reasons for not wanting to get the flu shot. "I don't like what is in the shot" or "don't trust the medication is safe"
"If I get the shot I will get sick"
"Getting the shot might or might not be effective, so what's the point?" Dr. Daliah Wachs has heard the reasoning before and while she understands the concerns of people she says the vaccine can save your life. When it comes to wondering if the flu shot is safe Dr. Wachs said, "We have not seen any data to show that the solutions that the flu shots are in will actually hurt you." Dr. Wachs said the most common myth she hears is people claiming the flu shot gave them the flu. "Number one, you could be getting the flu shot too late. You get the shot but you were already exposed [to the flu]. Number two, sometimes we get the flu shot and start to build up your immune system and kind of feel flu like, but it's not the full blown flu," Dr. Wachs said. Lastly, she said while the flu shot is the most effective at 60 percent, even a weak strain will make a difference when it comes to saving your life. "So what about last year when it was only 16 percent effective? The thing is it still saved lives," Dr. Wachs said. Of course the bottom line is if you have concerns with receiving the shot visit your doctor right away.